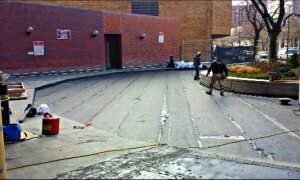 Work on the Circle Driveway continues. Fortunately all we really need is dry weather to complete the work underway, so the crispy temperatures are not holding them back. This work will continue and they expect to begin installing forms and pouring the new drive as soon as next week, so long as the dry weather holds. Once the concrete patches were determined to be sufficiently cured, the corners and curbs were cut in, followed by the walkways and drive. Originally, the failure of the old membrane is what resulted in leaking into the 1p garage below. This work, at these location, were perhaps what was most needed. Parkers under the driveway now have more reasonable assurance that the sporadic leaking and dripping on their vehicles and parking spots should now be under control. Once the topping slab is completed, the final steps will include setting the drains and replacing a problematic drain line underneath the driveway and planter and of course installing the railings. Railing installation is now underway for the Phase 1 portion of the project, beginning with the locations around the new planter and ramp. This will continue across the plaza and stairs leading up to the mall entrance. As they do this, the protective barrier and temporary railings will be taken down. The masons will be finishing the clean up of the North end of the brick wall, and demobilizing. We are still waiting for final word from the City of Chicago and ComEd about the planned replacement of the vault roof which is under the sidewalk and bus stop. 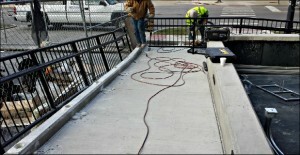 Installation of the vertical paneling along the sidewalk will be held back until we receive final details about the locations of the sidewalk which will be demolished by ComEd to complete their project. As always, contact the office with any feedback or questions.